Location Abbreviations/Explanations: CMP (town of Cape May Point); Coast Guard Ponds (ponds/marsh located on south side of Ocean Drive, between Cape May and Wildwood Crest); Cold Spring Inlet (entrance to Cape May Harbor, accessed from Two Mile Beach Unit of Cape May National Wildlife Refuge). Abnormally cold weather continued to negatively affect waterbird numbers, and several sources suggest that February 2015 will be among the coldest locally since records have been kept. 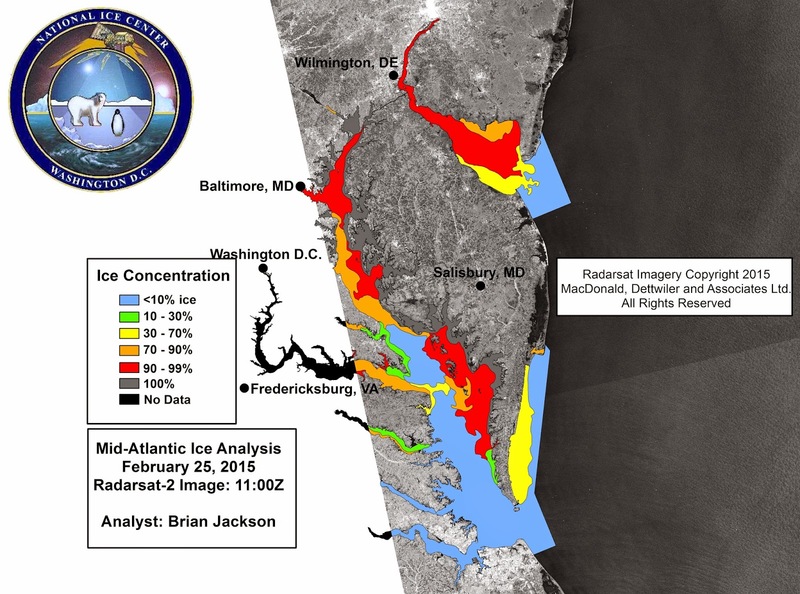 Significant ice cover remained on most fresh and brackish water, and additional ice cover overtook much of Delaware Bay and many Atlantic back-bays. An unbanded and free-flying female Ruddy Shelduck that appeared at Erma 7 Jan (SWh) was apparently not reported for a second straight week. Though most North American records presumably refer to individuals that have escaped from captivity, it is worth fully documenting the species’ occurrences here, as it is also a candidate for natural vagrancy. Observers are encouraged to report any additional sightings. The trio of Harlequin Ducks at Cold Spring Inlet remained through at least 25 Feb (DF, KH). Other noteworthy waterfowl included typically-scarce Canvasbacks, Redheads, and Common Mergansers at several locations throughout the county (m. ob.). At least 2 Red-necked Grebes were again in the vicinity of Avalon’s 8th Street jetty through the week (m. ob.) and another flew past Hereford Inlet 23 Feb (TB); one might expect to see more of this species given current ice cover on the Great Lakes. An American Bittern again greeted an observer at Nummy Island 26 Feb (DF). Pond Creek Marsh played host to a light-type Rough-legged Hawk--always rare on Cape Island--26 Feb (GDa et al. )., while another put in an appearance at Reed’s Beach 21 Feb (TR). ‘Western’ Willet was reported for a second straight week, this time a flock of 12 at or near the Coast Guard Ponds 22 Feb (PB). A handful of Red Knots remained at Two Mile Beach through the period (m. ob.) Otherwise, shorebird reports were sparse, save for numerous roadside American Woodcock (many hit by cars) throughout the county (m. ob.). An Iceland Gull flew past the north end of Avalon 25 Feb (GDw), and Lesser Black-backed Gulls were noted at Two Mile Beach 25 Feb (MP) and CMP 27 Feb (DF, KH). After nearly a month without sightings, a Eurasian Collared-Dove was glimpsed at CMP 24 Feb (fide Keekeekerr). Observers are encouraged to continue reporting the species at Cape May. Recent Short-eared Owl news consisted of singles viewed at Jake's Landing 22 Feb (m. ob.) and at Pond Creek Marsh 27 Feb (MP). In what has become a sad trend, very few American Kestrels have been seen in Cape May Couny this winter-- a male was a welcome sight at Reed's Beach 26 Feb (TR). The list of “hardy lingerers” dwindled yet again this week, and we received zero reports of the Tree Swallows, Eastern Phoebes, or Orange-crowned Warblers that had been hanging on at Cape Island. Rusty Blackbirds remained a semi-regular sight at the Rea Farm/Beanery, with sightings through the period (m. ob.). Pete Bacinski (PB), Tom Baxter (TB), Glen Davis (GDa), Gail Dwyer (GDw), Don Freiday (DF), Kathy Horn (KH), Mike Pasquarello (MP), Tom Reed (TR), Scott Whittle (SWh). eBird. 2012. eBird: An online database of bird distribution and abundance [web application]. eBird, Cornell Lab of Ornithology, Ithaca, New York. Available: http://www.ebird.org. (Accessed: 27 February 2015). Fogg, B. 2013. Keekeekerr: Recent Text Alerts. Available: http://keekeekerr.com/textalerts/keekeekerr. (Accessed: 27 February 2015). Going Back to our Roots - and the significance of swirl! On the top shelf behind my office chair sits a line of rather dingy-looking, colored and stapled collections of pieces of paper. Take them down from the shelf, and they morph instantly into a magnificent piece of history - a set (well almost!) of annual publications of The Cape May Geographic Society. This society came into being in the late 1940s and was, to all intents and purposes, the precursor to a Cape May Bird Observatory; an organization of local and not-so-local people who wanted to study and get to know the wildlife of Cape May. In the early years, one of the main obsessions was very befitting of a coastal community - the study of shells. A number of articles appear on the subject in the earliest reports, ranging from an interesting piece on fossil shell species collected from the canal spoil banks - remember the canal had only just been created in 1942 so there was much to explore here - to a listing of the prize-winners in the annual Shell Collectors' Contest. Shell collecting was a very popular and pleasurable pastime in those days and I am sure that much kudos was placed on taking part and getting a prize. In these days of high-tech, online, get-it-finished-by-yesterday obsession, many will probably scoff at the simple pleasure of a shell on a beach. And yet these local clubs and societies form the very bedrock that modern day conservation and wildlife organizations are built upon and a return to our roots now and again is, I believe, something we could all benefit from now and again. Somewhere, sometime, someone, said to me “You know water swirls the other way in the toilet below the equator. Really?!! Yeah and shells spiral the other way too. Really?! That’s very, very cool. I didn’t think much more about it. Back in the 1980’s, on vacation at the Outer Banks, I came across a shell that spiraled the other way from all the others. Wow! Look at that! If there’s one, there should be more. Now I had a new goal, find the different one. 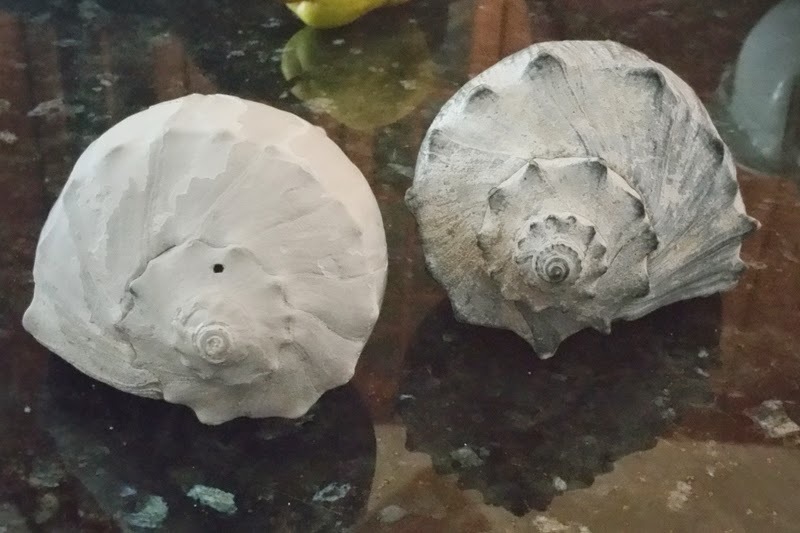 It became a “vacation thing” looking for the different swirling shell. Swimming or wading through the water in the troughs the waves made at the shoreline, quickly gleaning through shells littering the sands. A great way to cool off, relax, and forget about the trials and tribulations of work. This activity always made me think of the comedian Steven Wright. 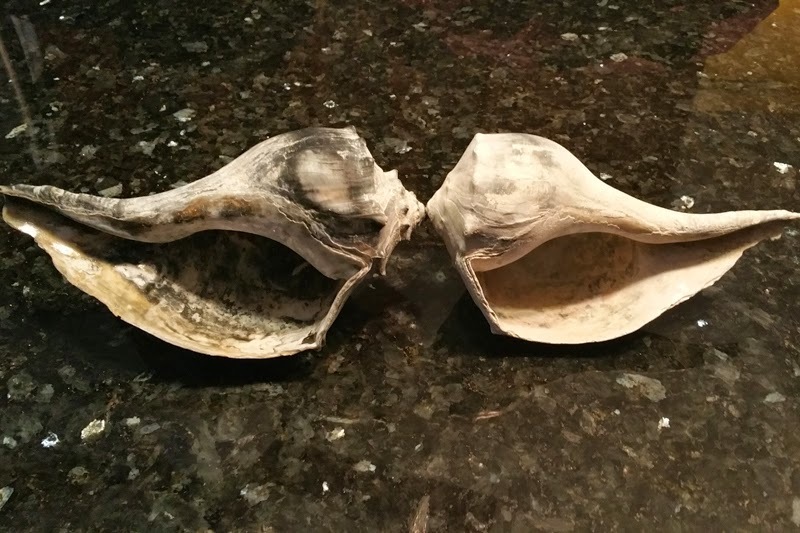 “I have a very extensive shell collection……I keep them on beaches all over the world.” I found maybe 2 more over the Outer Banks vacation years. Fast forward…... I have been walking the “Jersey Shore” beaches for many years now and never found a, what I call a “lefty”. 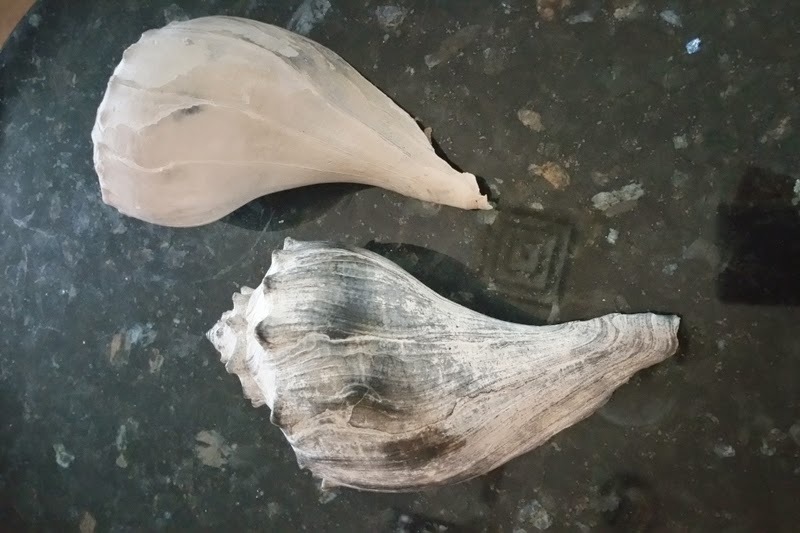 On a recent January day walking (and birding) along Two Mile beach, Kathy (my extraordinary wife and birding partner) came across a slew of Knobbed Whelk shells. Instantly I went into “look for the different one” mode. Whoa! Got one! Check this out Kath! Okay now I need to know more. Smartphone, Google, Bing, Yahoo not a problem. I found out all kinds of things, but according to all, it isn’t true. Water will swirl either way and shells that spire counterclockwise could be an anomaly of DNA & RNA coding, but more than likely, in this case, it is the Lightning Whelk. This species is left-handed or sinistral shelled and is native to southeastern North America, south to Florida and the Gulf States. It is the Texas state shell, and Knobbed Whelk is the New Jersey state shell. I always thought that a shell moving along the ocean currents for thousands of miles and many moons while landing at my feet relatively whole and smoothed by its journey, was intriguing. Kind of romantic. Alas not the case. Still though I find it awesome there is an occasional opposite and Yin/Yang happens. Much like left-handed people. We all know how awesome left-handed people are. Just ask any of us. Like Roger, I too am left handed - and we have to bear the cross of being referred to as 'sinister' rather than 'dexter' - while I would also like to point out that the scientific name for the sinstrally-twisted Lightning Whelk is Busycon perversum! !